Jean-Luc Colombo has the taste for good and well made things. Great hedonist, gourmet, talented cook and fine master of wine and food matches, Jean-Luc begins in 1984 (after having acquired his oenology diploma) as consultant oenologist and creates with his wife Anne (oenologist too) an oenology laboratory in Cornas. 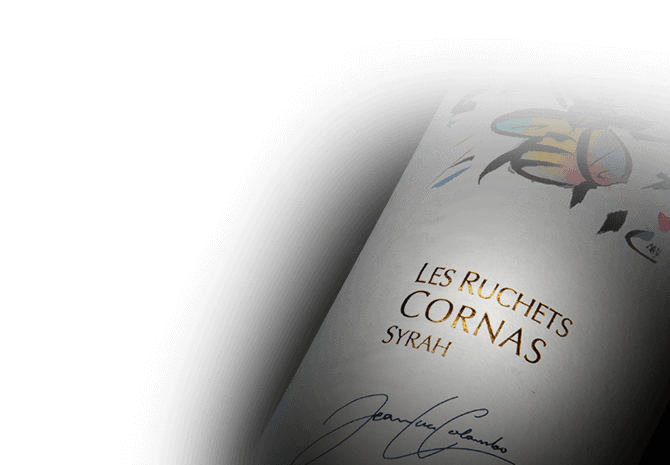 Aware of the real potential of the Cornas Appellation, of a breath taking character, Jean-Luc and Anne decide in 1987 to put a lot into vine as wine grower and wine maker. They buy on the heights of the appellation their first hectare on a steep hillside, "les Ruchets". This iconic parcel remains in the very heart of the Colombo family adventure. It lays on granitic arenites that are characteristic of this appellation and provide to old Syrah all the necessary ingredients to produce iconic wines. This selection by the parcel was to open the doors of the Hall of Fame of the Rhone Valley wine trade great personalities to Jean-Luc Colombo.